Making your own set of CNC Box wrenches/Joe Peitz - Millhill Supplies Ltd. 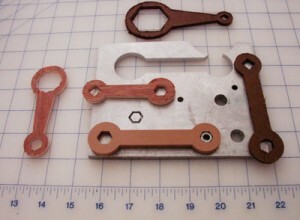 Shown above are several test parts cut from wood to test the g-code plus a piece of aluminum from which one of the wrenches was cut. A text file in .TXT format that contains the g-code can be downloaded here: CNCboxwrenchGcode. The code has a lot of comments added in parenthesis to explain the process in further detail. If you g-code experts out there have any suggestions for improvement we will pass them on to the author.